I'm sure you've noticed that our Design Team loves Clean and Simple cards. This week, I challenged our Muse to try something with a little less (gasp!) white space, so that we could all be inspired by something beautiful (as all our Muse cards are), but that maybe wasn't CAS. Michele rose to the challenge with enthusiasm and the result is a bold, dramatic Muse that you can interpret into your own style! We can't wait to see how you're inspired! Thank you! I hope you have a bit of time to play cards with me this week!! Oh my gosh Michelle, this card is amazing, gorgeous my dear, what a lovely Muse. Thank you!! Thank YOU, Maria! 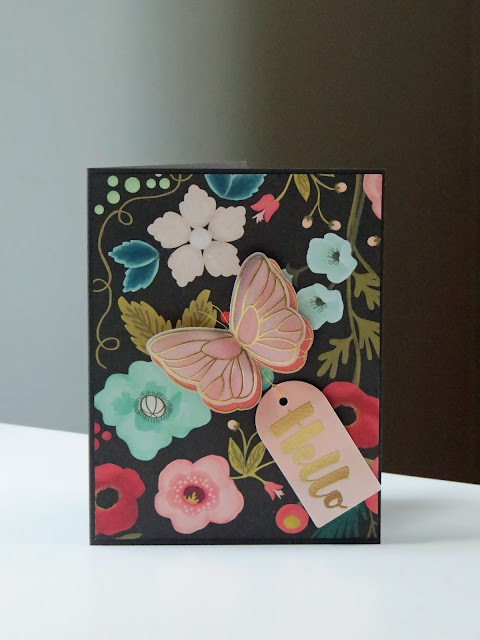 What gorgeous little paper will you use? Hmmm? HELLO Gorgeous!!! And the card is Stunning too:)) Hope to play along! Right back at YOU, LauraJane - and I can't wait to see what you create! Wow I am so in love with this card. you are so talented. Well now I'm just blushing ... Aileen, thank you! Just a girl who loves to play cards! Lisa Haines! I love your card!!! I've lost my Flickr account somehow, but wanted to say thanks so much for playing cards with me this week!!! Pam A. Gorgeous DP!! and love your pretty winged stand-in!!! Thanks so much for playing cards with me this week! so disappointed I missed the date. Was really looking forward to trying this one but ran out of time. Theres so many brilliant cards here. Good luck all. Hey, Aileen, it's open until Monday morning - we'd love to see you join us if you can! I don't know why but when I clicked on the challenge it came up with voting opens in so many hours and no link in available but that could have been just me clicking on the wrong page. Was trying to push things along before I set off for mum and dads. Sorry for the confusion. I'm sorry, Aileen - there is a blue button to the left of the 'voting opens' that says 'add your link'. I'm not sure what happened for you - if you can't find the button and you have time, please email me the photo and I'll link it up for you. If you miss the deadline, I'm so sorry, and I hope it won't discourage you from playing next time! ElizStewart: must find that Flickr account!!! So sorry I cannot comment there. Your tagged snowflake is just the sweetest idea ever! LOvely burgundy paper - a perfectly lovely card! Thanks so much for joining us at the Muse this week! I had so much fun visiting you all this week ... each and every card is a charmer! Thanks, everyone, for stretching your wings, and using that patterned paper ... or making your own!!! But, most of all, for "playing cards" with me at Muse this week!!! What a gorgeous gallery!